I thought the pain was gone, but I was wrong. It's been over 6 months now and today it feels like the day we lost you, girl. Every time I read these memorials it helps to know I'm not going crazy missing a little dog so much, that there are others out there just like me. We still have our little boy Oli, and he helps us through each day. I miss her more than humans I have lost in the past. I do also think about her and smile though, even laugh sometimes. She was a funny little thing. 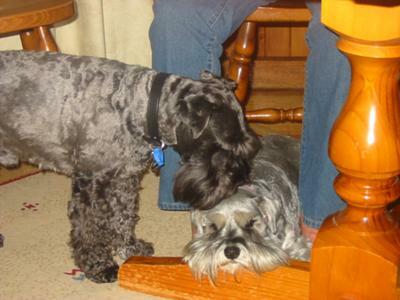 I lost my Schnauzer Fritz in 2009 and my girl CoCo just over a month ago. Not a day goes by that I don't think of them. Sometimes I cry but mostly I smile, thinking about all the good times and wonderful gifts they both brought to my life. I am so sorry about Mia. 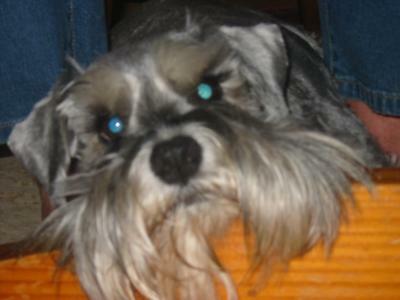 I lost my little schnauzer back in May and it is so tough. I miss her more than anything in the world. She gave me the unconditional love nothing or no one else could. She was with me through the good times and bad. I loved her so much. I had her brother and he passed away several years ago, but I still had her, so it was not as hard on me. Go quickly and get another one. It will help you. 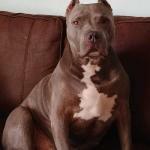 I am getting one soon, she will never replace my girl, but somehow I know my Carley Girl would approve. Take care and don't let anyone tell you not to be sad, she was a member of your family and a very big part of your life. Keep the memories and love in your heart forever. She will be waiting for you in Heaven. I can tell you from experience that you will not get over it. I lost Buster 4 years ago and think about him almost every day. I have thought about not reading these on dogquotations.com, and did for awhile. Still didn't help, so I continue reading. My only comment is --you will not quit thinking about losing your pet. Just cherish the time you had.